Great Egret hunting on dry land. Periodically, I get questions ranging from curiosity to alarm upon finding herons or egrets far from lakes, streams or estuaries. Herons and egrets are so closely associated with water that many people do not realize herons and egrets are more than water birds. In addition to hunting in large bodies of water, you will also find herons and egrets of many kinds feasting in small creeks at creek apartments, small backyard ponds, and agricultural fields, berms, freeway offramps,also in grasslands where there are no bodies of water. 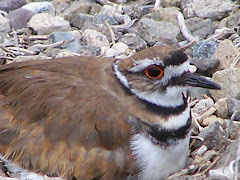 In addition to fish, amphibians, and mollusks, Herons and egrets also eat insects, small reptiles, and small mammals such as rats, gophers, and moles. They can be found on land far away from obvious sources of water. However, there is more water around than you may think, and sometimes the heron or egret you see is not very far from water at all. People are not always aware of parks with small lakes and streams. In Orange County there are numerous parks which have lakes and streams that are stocked with fish. The same is true of Los Angeles. But there is another water source birds frequent other than lakes, rivers, and oceans that animals frequent: the watershed. Great Egret in the grass at San Jacinto Wildlife Area. Rain and the runoff from the water we use flow to the ocean. We don't often think about how it flows there. But like a body's circulatory system, the land we live on has a system for getting rid of excess water that does not sink into the ground and fill up the aquifers. It is called the watershed. Originally it was a natural system of small streams and rivers. However, we have lined most of the watersheds in cities and suburban areas with concrete. You may not realize that Orange County's 350 miles of regional flood control channels and drainage branch through your city and down to the ocean. In fact, you are probably so used to seeing it that it does not register at all. The drainage system that flows through our cities and towns supports a lot of wildlife including herons, egrets, shore birds, fish, coyotes, and much, much more. If you stop and look down into that fenced drainage ditch, you may be surprised to find ducks, geese, egrets, herons, and shorebirds. Coyotes and other animals use the watershed to travel in much of Orange County through drainage ditches, canals, streams, and rivers. They disappear into the drainage ditches and reappear somewhere entirely different. So the egret or heron you see flying so far from water in reality is never very far from a drainage ditch, canal, stream, or river. How do the fish get into the drainage ditches, canals, streams, and rivers? Well, lots of ways, but one way is on the feet of the birds. Birds fish in a place that either naturally has fish or is stocked with fish, and the fish eggs stick to their feet. The birds fly off and then land in a new water source with no fish. The fish eggs fall off their feet into the new stream, lake canal, or drainage ditch, and voila! A new water source now has fish in it. Herons and egrets forage most commonly in the water or near it, but sometimes egrets and herons forage for small mammals, reptiles, and amphibians on dry land. They have a lot of variety in their diets, so don't be surprised to find egrets and herons on the hill top, in a field, or hunting on the grass on your local freeway offramp. They do hunt on dry land. They will fly through your city where you know of no lake or stream. They are usually near some water, but even if they weren't there is no cause for alarm. They hunt on dry land, too. Enjoy them where you see them. Egrets and herons are beautiful in the water or on dry land. Enjoy watching them wherever you live in Orange County. Video by Ron Scholl. From his channel ronlouisscholl's channel. From Michael Bukay at http://bukaymedia.com. Check out Michael's website. He has some amazing nature videos. 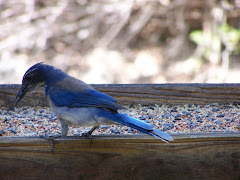 OC Birder Girl post on understanding the watershed. OC Birder Girl post about the herons, egrets, and bitterns of Orange County, California. There is a fight going on over Fairview Park in tiny, densely populated Costa Mesa. And it isn't pretty. It is a familiar fight in Orange County. A fight between people who see open land as the raw material of their dreams, and those who appreciate the natural beauty of the land and want to keep it as it is. Fairview Park is unique in many ways. 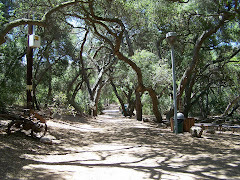 Unlike most parks in Orange County, not much has been done to improve the rugged terrain which was home to two Native American tribes for thousands of years: the Juaneño Band of Mission Indians, Acjachemen Nation and the Gabrielino-Tongva Tribe aka the San Gabriel Band of Mission Indians. Shells from their meals are still visible in the soil of this largely undeveloped park. Fairview Park covers 208 acres which straddles both sides of Placentia Avenue. Of that 208 acres, 155 acres sits on the west side of Placentia adjoining Talbert Regional Park aka Talbert Marsh and also adjoining Estancia High School. The remaining 53 acres sit on the east side of Placentia adjoining the Costa Mesa Golf Course. Bridge to the east side of the park. Male Northern Harrier flying over the mesa. 7) it is one of the few undeveloped parks where children and adults can see wildlife that needs wide, open spaces and where they can view the incredible, undeveloped beauty of the land itself, and finally 8) sports fields, and other activities are not enough reason to destroy what some call the Jewel of Costa Mesa. Interpretive sign up on the mesa. It is the geography of Fairview Park which makes it so desirable to the humans on both sides of this controversy and to the wildlife that lives there. It is in fact what drew Native Americans and later the Spaniards and Mexican settlers to this place. The City of Costa Mesa is named after an elevated table of land that stands above the river and the ocean. Fairview Park is part of this land formation for which Costa Mesa was named. Fairview Park consists of the mesa and the land below. So that you can stand up on the mesa and walk down below onto the land that abuts the river and Talbert Marsh. This particular combination of the lower lands and the mesa is also what makes this park so very attractive to the wildlife that inhabit it. Turkey Vulture Soaring over land below the mesa. As the wind blows in and hits the mesa, it creates an updraft which raptors love. The updraft helps raptors gain altitude so that they can soar high above the open land and watch the ground below for prey. And so they come to Fairview Park to take advantage of the updraft and to hunt on the large, flat mesa, and to rest in the trees on the land below. Raptors need lots of open land to hunt. Fairview Park is the perfect place. 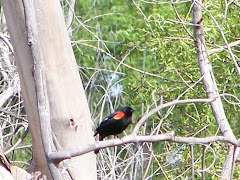 Fairview Park is also a birder and photographer's paradise. The combination of high and low land is what makes it possible to obtain incredible views of the raptors that both feed and possibly breed here as they fly up over the mesa and the low lands. It is an amazing place for people of all ages to view nature as they have rarely seen it. I have seen pairs of Red-tailed Hawks, Red-shouldered Hawks, Northern Harriers, White-tailed Kites, Cooper's Hawks, and American Kestrels perching, soaring, hunting, and catching prey at Fairview Park. 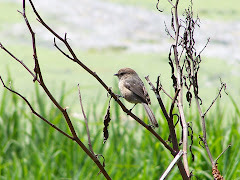 I have seen them resting in the trees of adjoining Talbert Regional Park and even in Fairview Park on the trees and posts set down in the lower areas near the wetlands. Pair of Red-tailed Hawks in courtship display over Fairview Park. 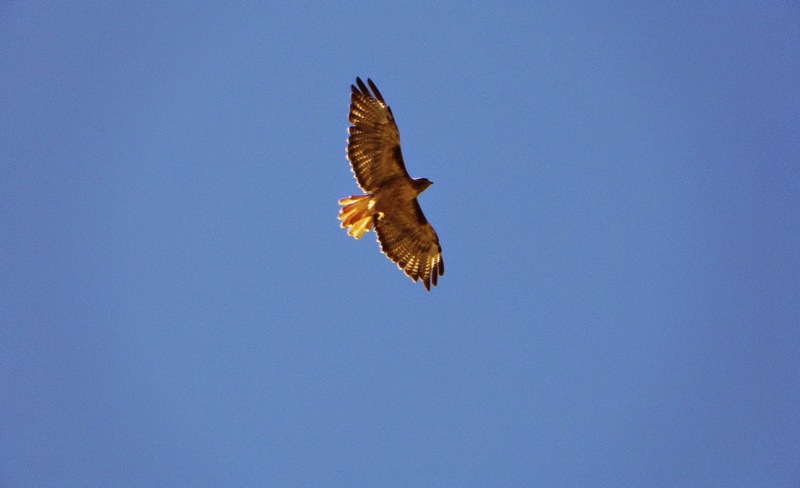 One day, I looked up into the skies above Fairview Park and saw a Red-tailed Hawk courtship display. I watched as they hurtled down toward the ground and disappeared into the marshy area below the mesa. They soon appeared again, and began another display. American Kestral hovering over the grasslands on the mesa. There are usually American Kestrels visible in several areas: in the trees near the parking lot, on the mesa perched on bushes and plants, and hovering or soaring over the land. Northern Harriers fly low over the mesa in the fall and winter. Cattle used to graze here on the mesa, but now in spring, Western Meadowlarks fill the grasslands with their flute-like calls. The Western Meadowlark is fast disappearing from Orange County as undeveloped becomes the fulfillment of someone's dreams of development. But here in Fairview Park, Meadowlarks still land in flocks on the grassy mesa in the spring. Interpretive sign about the vernal pools. One of the vernal pools on the mesa. Vernal pools are areas of land that have difficult to drain clay or other substance under them. When it rains, these areas drain more slowly than the surrounding area, and the rain forms pools of water and life. These pools are inhabited by special animals and plants who can survive in both wet and dry environments. Fairview Park has at least 7 vernal pools. Vernal pools are seasonal and come and go with the rainy seasons. When there is no rain, they are dry and bare--filled with dormant life waiting to be reborn during the next good rain. The vernal pools contain San Diego fairy shrimp which are an endangered species. You can read a bit about them here. And a watch a short video about them here. Earlier this year, a path which encroached upon a vernal pool was mysteriously built with no permits by unknown individuals. This violation of federal law brought the federal government into Fairview Park. See this LA Times article "Vernal pools at Costa Mesa park need protection, agency finds" by Bradley Zint for more information. The city was required by the federal government to pay $19,000 taxpayer dollars to remove this unauthorized path. See "Granite removed from Fairview Park trails" by Bradley Zint from the Daily Pilot. Another article, Mystery trail focuses eco attention on Fairview Park also by Bradley Zint. And another about the same incident is Mensinger to meet with officials about trails by Jeremiah Dobruck. Mayor Pro Temp Steve Mensinger asked to meet privately with US Fish and Wildlife officials about the path. This was back in January 2014. What he said is not known, and no one has admitted responsibility for the unauthorized path. Interpretive Sign on the mesa. This beautiful land drew Native Americans to Fairview Park thousands of years ago. The mesa was close to food sources in the river and the ocean, but the mesa was high enough to keep them relatively dry compared to the lands near the river and marshes. The Gabrieleño/Tongva and the Juaneño/Luiseño built shelters, prepared meals, and lived their lives on the land of Fairview Park. Their descendants still care about the history here in Fairview Park and consider the land in the park sacred. Here's an article about the native tribes who visited Fairview Park. You can stay current on the fight for Fairview Park by checking Save Fairview Park and their Facebook Page Friends of Fairview Nature Park. Path on the top of the mesa. According to the Native American website, Sacred Sites of California, the villages and burial sites here in Fairview Park weren't considered endangered until recently because they were a part of a government-run park. As such, Native Americans thought it was well protected. From the top of the mesa, a view of the trees below. On 08/06/2014, at a Fairview Park Citizens Advisory Committee meeting no decision was made on sports fields for Fairview Park, but there was plenty of discussion. Amid community controversy, Adelia Sandoval, representing the Juaneño Band of Mission Indians, Acjachemen Nation,stated, "The tribe itself does not want to see any new development on this sacred site." From the YouTube video of the meeting she further stated that this is also a very sensitive archeological site. What do we teach our children when we say gaining additional recreation land is a good reason to disrespect our Native American peoples in Orange County yet again? Shells in the ground all over the mesa at Fairview Park. Adelia Sandoval also said that people do not speak up often enough for the land. It made her very happy to hear people speaking up for the land at this meeting "because the land itself does not have its own voice." She especially commended a young teenager for hearing the voice of the land and speaking for it. The young girl spoke with heartfelt passion about the land in Fairview Park and her confusion as to why the city would even consider destroying such wonderful place "that is perfect just the way it is." She brought up how Fairview Park has been part of her life growing up. Obviously, nature is something that means a great deal to this young girl. What do we teach our children when we say another sports field is a reason to trample over the feelings of other children and adults who love the wildlife and who love this land as it is? The long wall borders the Santa Ana River. Looking down from the mesa. And this young girl really illustrates the crux of the matter regarding the development of Fairview Park. Those who advocate for a sports activities imply that those who don't want this kind of development are against our children. That sports activities and development are more important than anything else. Nothing could be farther from the truth. Our children need this land in its natural state. Many children are not on sports teams nor do they want to be. And not because there aren't enough sports teams, but simply that they find their relaxation, recreation, healing, and learning experiences about life elsewhere. Sports can be valuable to kids and adults--I would never argue that it can't. But it is not the ONLY thing that matters to people or to children. It is not the only thing that contributes to their well-being. This land in its natural state can bring other dimensions of learning, enrichment, and experience to people that sports cannot bring. Great Egret in the newly restored wetlands in the lower area. There are many children who love the opportunity to exercise and have the restorative experience of being out in nature. They feel part of something. They have the opportunity to volunteer and be part of restoring the environment or participating in scientific observation of nature. Nature is an incredible healer for people of all ages. Working together as a team to restore habitat, valuing others and their contributions, learning to listen and to observe, learning respect for wildlife, and learning respect our Native Americans and understanding the history we share with them on this land are all things that are all important things for our children. We need to do something other than consume. We need to preserve. View from the mesa of a wetlands pond. We need to see the value in this land. In the decision to turn a unique place that is contributing to the well-being of many people in Orange County into a place that serves a very limited purpose and a limited population, one must very carefully consider what that transformation will cost the citizens of Costa Mesa and the citizens of Orange County. Because there will be a loss if this happens. Sports fields and recreation are good, but it is not the most important thing for which all other good things must be sacrificed. I feel for these fathers who spoke of the need for sports fields, but their vision is limited. And their black-and-white view that the solution is Fairview Park or nothing is simply wrong. It is the classic philosophical false dilemma. There are other options in Orange County to participate in organized sports without destroying the "Jewel of Costa Mesa." As the population of this small city grows because of dense development, the solution is not to encroach into open land that is federally restricted. It is not to begin to chip away at more land that brings peace and healing to citizens needing comfort after a long day. It is not to destroy the land for which the city was named. And the solution is definitely not to develop more land that is sacred to the Native American peoples from whom we in Orange County have already taken so much. One more sports field or sports activity in Fairview Park would solve very little of the problem of sports field shortages or open space for sports. And with the legal restrictions on its use, it is simply not an option. Should another sports field sneak its way into Fairview Park, my fear is that it will not end there. Let's be real. Costa Mesa is almost 16-square miles and has a population of 110,000 people. Costa Mesa has a population density of 7,000 people/sq mi. It is a small, densely populated city that is growing. Sometime in the future, Costa Mesa's high-density population will need more land for sports and recreation than the small city has to offer. However, there is nothing that requires that all open land be turned into homogenous sports fields and facilities so that every citizen in the almost 16 square miles of Costa Mesa plays sports in Costa Mesa rather than in a larger, less densely populated nearby city. Costa Mesa is a small city. Land is limited. That's reality. At some point, the small town of Costa Mesa will run out of land for additional sports fields and facilities. At some point, adults and children will have to go outside the city to find enough open space for sports fields and other activities. That's reality. There are only 16 square miles of land. I say that IF the only free land available for sports activities is a historically, culturally, and religiously important Native American site, then the time has already come. Costa Mesa has run out of open land for sports. If the only land left for sports is a part of land that contains rare vernal pools, endangered species, and is a part of a wildlife corridor, then the time has come. Costa Mesa has run out of open land for sports. And if the only land left is the very land formation left for which the city was named, then this small, densely populated city has run out of land for sports. If we let more of Fairview Park go for more sports, there will be more lights and parking and other fields because the need will grow and grow as Costa Mesa's 16 miles fill in with more and more people, and the Jewel of Costa Mesa will be just a memory. All the majesty of the land, the sacred and historical sites of our Native American peoples, and the wildlife will be gone forever. And for the children of Orange County and everyone else that would be a terrible loss. Fairview Park as it stands is important in many ways to many people in Orange County. But the truth is we may not have reached that point at all. According to supporters of Fairview Park, Costa Mesa still has plenty of land for sports. We have not reached the point of there being no land for sports. The fields are just being managed poorly. And still park supporters say, no team has been turned away. Consuming Faiview Park for sports is not even necessary. Park supporters say it is just an excuse to develop the land. Land that is full of wildlife and history and sacred meaning for Native Americans. Regardless of whether there are or aren't available fields, not one more foot of this unique land should be sacrificed for sports fields or other suggested uses such as basketball and handball courts, two-story interpretive centers, native plant centers, Native American interpretive centers, roller hockey surfaces, or dog parks. We must hold the line because the time has come to protect the history of this place, the wildlife of this place, and to show respect for the Native American peoples who are telling us this land is sacred to them and asking us not to develop Fairview Park in any of these ways. We must speak for the land because as Adelia Sandoval of the Juaneño Band of Mission Indians, Acjachemen Nation said, "the land itself does not have its own voice." So I am adding my voice to hers and the other people of this community who love this land in its natural state. This land should be preserved, and its habitat restored. It should continue to be a blessing to the children, the adults, and the elderly who are renewed, refreshed, and healed by the beautiful vistas, the history, the plants, and the wildlife. These are the people who view this land as a part of their lives as it is in its natural beauty. Who value its history beginning with Native American tribes who lived here for thousands of years. This land is not the raw material of someone's homogenous development dream. This land is a thing of value in itself. This land needs no development. Only restoration to its natural state. It is the Jewel of not only Costa Mesa, but of Orange County. Let's not chip away any more of this precious jewel. Possible Ruby-crowned Kinglet. 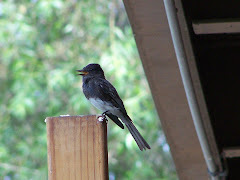 The under tail feathers were very white. City of Costa Mesa park site. If you want to find out what is going on with Fairview Park, this is the group. "We are a group of Costa Mesans that want to protect Fairview Park as we know it, an open space passive use nature park, and to help it become one of the best nature parks in Orange County. Fairview Park is the last bit of nature we have in an otherwise built out city. Just like the best nature parks the world over, the value of this area comes from it not being developed." This Facebook page has lots of information about Fairview Park. This is the above group's Facebook page. "This page is dedicated to enjoying, documenting, and protecting the wildlife and wildlife habitat of Fairview Park and saving this area from development." Threats to vernal pools and the San Diego fairy shrimp range from park goers to illegal paths. The wetlands projects filters runoff from the Santa Ana River through Fairview Park marsh to clean it prior to the river emptying into the ocean.